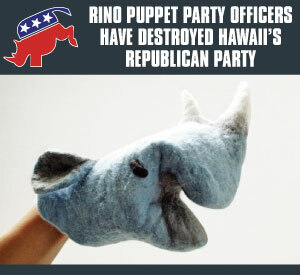 As promised, HIRA has more shocking news for you about the misdeeds of RINO party leaders in the months before the Hawaii GOP's self-inflicted tragedy in the 2016 election. Plus, we have shocking revelations about the twisted priorities of these 'leaders' who devoted 100% of financial resources (hundreds of thousands in donor monies) over the 24 months since the 2014 election to a single category of spending: 'administrative overhead'. Not communications. Not organizing. Not mobilizing. Not candidate support. Just mega-expensive administrative overhead. Even the party's puppet treasurer Mary Smart knew early on that 2016 was a lost cause for the GOP and its state and local candidates; opting instead to fund candidates directly from her own pocket (and urging others to do so), in light of the widespread hostility of Hellreich's puppet state committee toward helping candidates and her knowledge of the party's terrible financial shape. You'll hear the stunning 'closed door' meeting audio below , leaked to HIRA by a now former member of the party's executive committee. 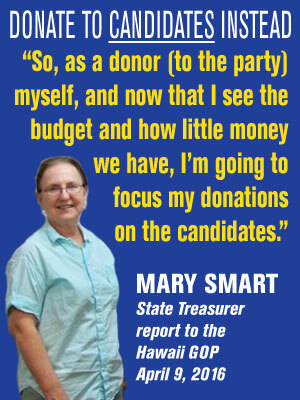 According to an extremely fair review of party treasurer Mary Smart's secret financial report to the Hawaii GOP state committee back in April 2016, the writing was on the wall and warning signs were everywhere that she and her teammates on Team Hellreich were knowingly running the party into the ground and setting up dozens of GOP candidates for easily-predicted disaster . . . which is, in fact, precisely what happened: 100% of all GOP challengers lost, 28% of incumbents lost, and the party burned through $15,000 to $18,000 per month while hurtling towards massive political defeat with reckless Obama-like deficit spending on overhead. 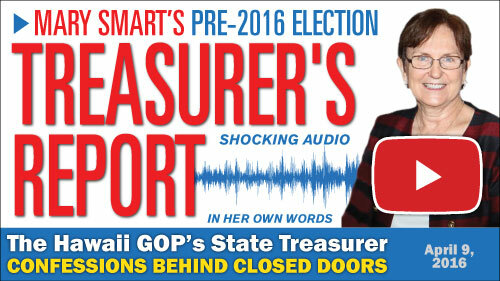 With hundreds of thousands of donor dollars wasted in the two years since the 2014 election , this audio recording (below) of Mary Smart's secret 2016 pre-election treasurer's report (previously unheard outside of the Hawaii GOP headquarters on Kapiolani Blvd.) reveals that financial conditions were so bad that longtime-party-benefactor-turned-puppet-treasurer Smart acknowledged during her official treasurer's statement to the do-nothing state committee that GOP donors like her should give their money directly to Republican candidates . . . a verbatim echo of what HIRA has been urging Republicans to do for over a year now. 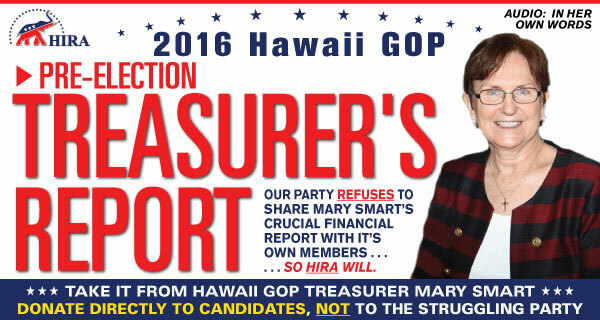 But, when combined with even more recent financial data (obtained and independently confirmed by HIRA with the Federal Election Commission ), things at the RINO-controlled Hawaii GOP are even worse than puppet treasurer Smart reported. The horrible 'Election Day 2016 Massacre' of Republican challengers and incumbents engineered by Smart and other party leaders almost pales in comparison to the sheer abandonment of sound financial planning, honest budgeting, and cash flow management by Treasurer Mary Smart and her co-conspirators in the systematic devastation and looting of the Hawaii GOP's financial assets in 2016; whereby overhead remained unsustainably high while their poor leadership led to nosediving income thanks to plummeting confidence by party donors. Deficit spending on steroids. Like so many RINO puppet party officers before her, Mary Smart abandoned her principles; dutifully and blindly followed Miriam Hellreich into the abyss and sought to cozy up to Hellreich RINO's while causing yet another GOP disaster at the polls . . . and at the bank. That's why it's no wonder Mary Smart and her puppetmaster Miriam Hellreich refused to contact law enforcement in late 2015 after state chair Fritz Rohlfing made off with $2,500 from the party's bank account without ANY authorization to hire a Democrat union lawyer . . . to the horror of puppet party officers and GOP leaders statewide. These RINO's didn't call 911 to report Rohlfing to the police because they seemed to know that everything else they were doing with party funds was SO MUCH WORSE than mere theft. 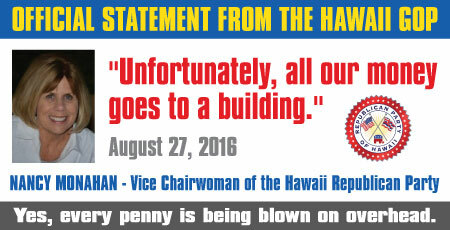 Arguably, the crooked Clinton Foundation is no match for the level of corruption and ineptitude at the RINO-controlled Hawaii Republican Party. 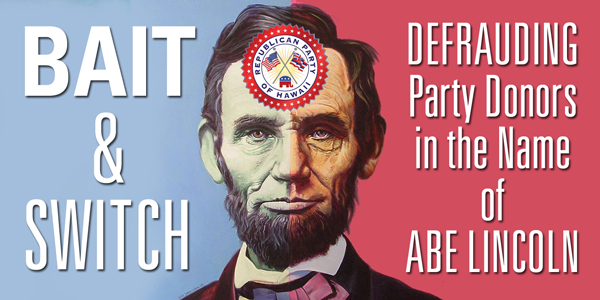 It turns out that all those Hawaii GOP fundraisers ("Lincoln Dinner", "Proud to be an American" capital campaign, et al) over the past few years were a complete waste of time and money. Clearly, the purpose of those events was strictly to maintain RINO control of our state party by vacuuming up all available monies from GOP donors and blowing every penny on administrative overhead and the acquisition of overpriced real estate - all while brave GOP candidates went to the biennial slaughter with no organizational or financial help . 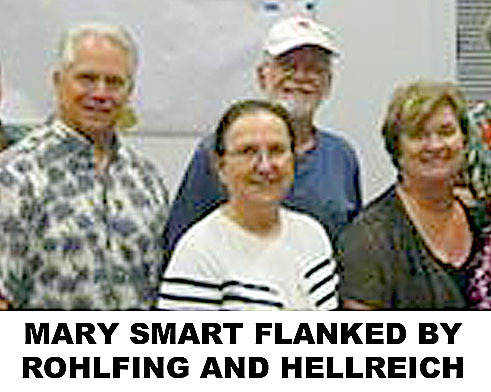 Smart failed to warn party members that Hellreich's puppet (and chronic disappointment) Fritz Rohlfing was making crazy promises of $50,000 for candidate support around the time of the August Primary and $100,000 for candidate support before the General Election. Puppet treasurer Mary Smart's secret financial report confirms what Rohlfing's vice chair Nancy Monahan had already blurted out several months ago in secret correspondence with other party leaders : "Unfortunately, all our money goes to a building." Mary Smart's scary and fiscally irresponsible financial record as party treasurer is no laughing matter, even though Miriam Hellreich's mindless, closet Democrat puppets on the party's state and executive committees clearly think it's funny. When these RINO's come asking for money in the very near future, you already know what they will do with your money: FLUSH IT DOWN THE TOILET OVER AND OVER AGAIN . Take it from puppet treasurer Smart : After auditing Smart's reckless deficit spending on behalf of Team Hellreich, HIRA completely endorses Mary Smart's secret conclusion . . . IT'S BEST TO DONATE DIRECTLY TO CANDIDATES. With all of the 'bait and switch' abuse of party funds, 'fiduciary responsibility' apparently has no meaning to party leaders who have spent every penny of donor money on administrative overhead and ZERO on spreading the party's message, organizing for victory, and winning elections. 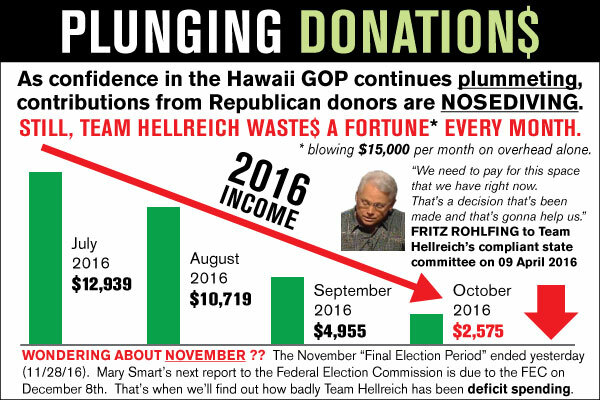 The entire party leadership controlled by Miriam Hellreich is complicit in the financial and political disaster for the Hawaii GOP. 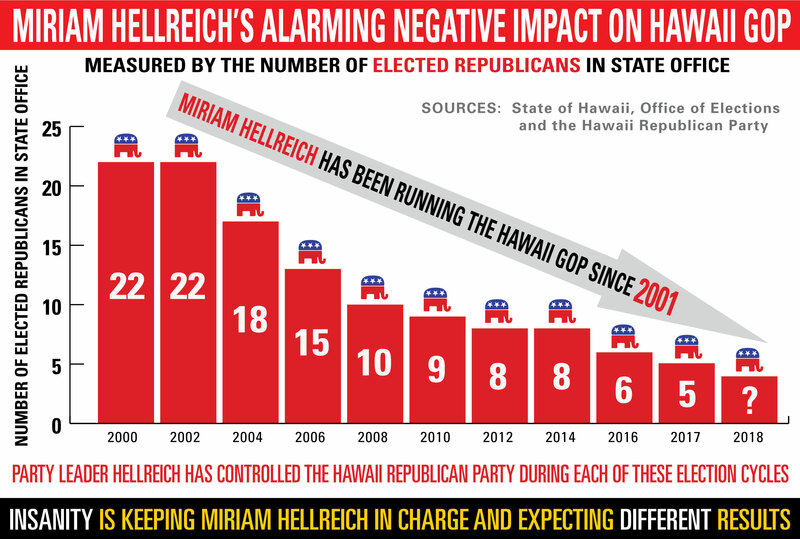 So until the swamp has been drained and the Hawaii GOP is under completely new management, Team Hellreich has destroyed the future of the Republican Party in Hawaii. If it wasn't for HIRA , Miriam Hellreich and her puppet officers would continue keeping it a secret from party members how much she and her puppets have damaged the party's brand and drained the party's treasury. Stay tuned for a shocking report of how hostile Hellreich's puppets really are toward helping brave GOP candidates; preferring to let them twist in the wind while funding the purchase of overpriced real estate and hiring of unqualified party employees with YOUR generous donations. Terminate GOP membership of backstabbing traitors like Kym Pine, who directly and actively assisted Democrat candidates in 2016 with money, endorsements and more. 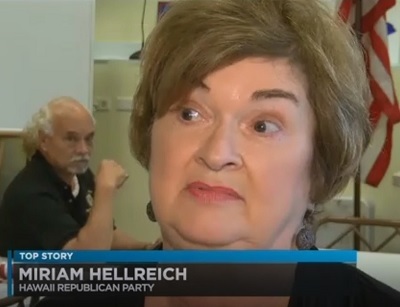 Why is it that Miriam Hellreich's puppets on the Hawaii GOP's executive committee, the county committees and the state committee always pretend that they have no responsibility for our party's budget, strategy, priorities and outcomes? In any other organization, wasting this much money, time, and countless political opportunities while failing so miserably in its mission would result in firings, audits, criminal charges, civil suits, and new management, if not a shutdown of the company or organization. The good news - CHANGE IS COMING: Join HIRA's leadership team today and Republican help will be on the way. If you haven't already done so, please pre-register to be part of the solution by visiting: www.HawaiiRepublicanAction.com . Republicans in Hawaii deserve better. We hope you'll join us!